At first blush, this series looks one-sided. The Calgary Flames (50-25-7) enjoyed a strong start to the season and carried that momentum throughout the year to clinch their first division title since 2006. Meanwhile, the Colorado Avalanche (38-30-14) rode their top line for as long as possible before hitting a brutal 5-16-6 rut from late December to mid-February. With their season hanging in the balance, they hunkered down as a group and managed to scrape their way into the playoffs as the second wild card. There’s a reason the games are decided on the ice, though. From health to puck luck and everything in between, so many variables can affect the outcome of a playoff series. In this case, goaltending is the major question mark. On the top seed in the Western Conference, veteran Mike Smith posted a horrific 89.8 SV%. His play has fallen so far that he temporarily lost his starting job to undrafted 26-year-old David Rittich (2.61 GAA, 91.1 SV%). They ultimately split duties down the stretch and it’s safe to assume that head coach Bill Peters won’t offer either netminder much rope. Due to playoff experience — or rather Rittich’s big-game inexperience — Peters will likely opt for Smith to begin the series. He didn’t fare well in his lone outing against the Avs this year, conceding five goals on 26 shots. It’s obviously a tiny sample size, but it doesn’t really inspire confidence. Very little of his game does anymore. Though the 6’5”, 220-pounder has the prototypical build, he’s prone to losing his focus and allowing more weak goals than a contender would like. Rittich, for his part, is indeed a newcomer to the postseason. The pressure in these games is unlike anything he’s faced thus far, and those who aren’t ready for that atmosphere often crumble. It happens every year. If he is up for the challenge, however, he would appear to be the Flames’ best option. He outperformed Smith in the regular season and looked solid in two contests against the Avs (2.49 GAA, 91.8 SV%). Those numbers aren’t spectacular, but Calgary doesn’t need its goaltender to be spectacular. The Flames’ on-ice save percentage (91.8 SV%) came in at 19th this season and they posted the best record in the conference. An average performance between the pipes should let the team’s third-ranked offense overwhelm its opponents in this series. On the flip side, Colorado absolutely needs Philipp Grubauer (2.64 GAA, 91.7 SV%) to steal the show in order to compete with Calgary. 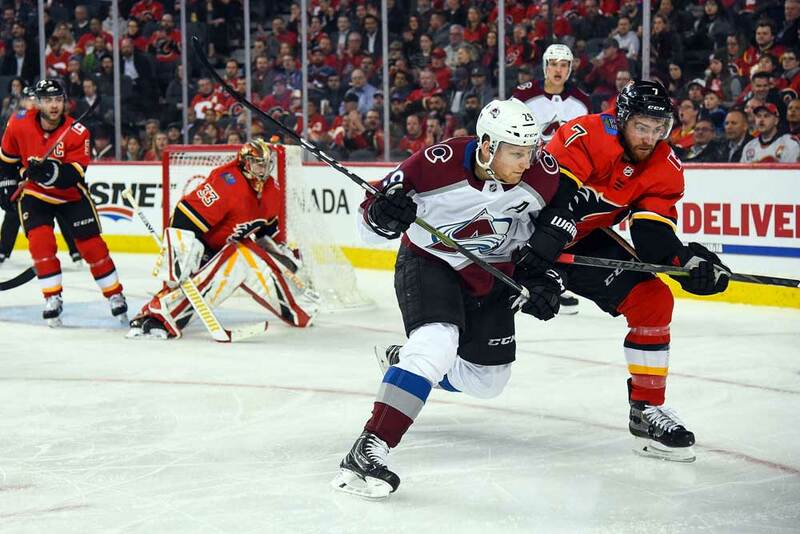 For much of the 2018-19 campaign, any mention of the Avs revolved around the top unit of Nathan MacKinnon (99 points in 82 games), Mikko Rantanen (87 points in 74 games) and Gabriel Landeskog (75 points in 73 games). They’re certainly a productive and electrifying trio, and they were the lone force pushing the team above the Western Conference also-rans. Unfortunately, that type of burden will take its toll. On January 1, Rantanen and MacKinnon ranked second and third in league scoring. Landeskog slotted in at 19th. Over the remainder of the season, Rantanen and Landeskog missed time with injuries while also producing at a lower rate. MacKinnon ranked 33rd in scoring over that span with 40 points in 42 games. That’s nothing to sneeze at. By that same token, it’s nothing to write home about given the standard he’s set over the past two seasons. As the line slowed down, the team seemingly had no answers and appeared ripe for an implosion. Even without shutdown personnel, head coach Jared Bednar made the bold decision to switch from firewagon to low-event hockey. Prior to the trade deadline, the Avs scored 3.32 goals per game and conceded 3.16. Following that date, the averages shrunk down to 2.58 GPG and 2.37 GAPG. That sea change paid off handsomely. Colorado went 11-6-2 to close out the year and clinch a playoff berth. With that said, this wasn’t exactly a defensive masterpiece. From late February onward, Colorado controlled just 48.4% of the shot attempts (20th), 48.3% of the scoring chances (20th) and 48.0% of the high-danger opportunities (21st) at 5-on-5. This amounted to an expected goal share of 48.8 (19th). Their actual points percentage? Ninth. In the end, a 27-year-old career backup simply took matters into his own hands. Since the deadline, Grubauer ranks second to Ben Bishop in both GAA (1.55) and save percentage (95.2). Over that same period of time, incumbent starter Semyon Varlamov (2.87 GAA, 90.9 SV%) floundered with a 3.19 GAA and 89.9 SV%. Basically, the Avs wouldn’t be anywhere near the postseason without Grubauer’s extraordinary performances. They’re certainly hoping he still has some magic up his sleeve because Calgary is a formidable opponent. While Colorado was playing rope-a-dope, the Flames were somehow continuing to improve and steamrolling the West: They posted a remarkable 57.3 CF% (1st), 57.1 SCF% (1st), 57.4 HDCF% (2nd) and 57.2 xGF% (1st) down the stretch. In addition to their puck dominance, they boast a stellar top six headlined by Johnny Gaudreau (99 points in 82 games). The shifty winger finished eighth in league scoring and propelled newcomer Elias Lindholm (78 points in 81 games) to a 34-point spike in production from last season. Center Sean Monahan’s (82 points in 78 games) fundamentals and Lindholm’s versatility allow Gaudreau to attack nonstop, carving up defenses with his elusiveness, vision and feathery touch. Already one of the sport’s finest playmakers, the 24-year-old took yet another step in 2018-19 and now has his sights set on delivering the goods when it truly counts. Behind that unit, there’s a dependable two-way line consisting of Mikael Backlund (47 points in 77 games), Matthew Tkachuk (77 points in 80 games) and Michael Frolik (34 points in 65 games). Peters has the luxury of sending them out against stiff competition and watching them regularly win their head-to-head matchup. As a trio, they’ve put up a 59.2 CF%, 58.4 SCF%, 56.6 HDCF% and 67.4 GF%. Calgary will likely task them with bottling up MacKinnon’s line, affording the rest of the team an easier go. Then there’s the ageless Mark Giordano (74 points in 78 games), who should be the Norris Trophy front-runner at 35 years old. His pairing with TJ Brodie has yielded superb results (57.7 CF%, 56.3 SCF%, 53.9 HDCF%, 59.8 SV%) and he’s never shy to jump up and supplement his club’s offense. Giordano is a true two-way beast capable of smothering opposing stars and contributing on the attack. That’s a lot to handle for the Avalanche — and Grubauer. His brief playoff history isn’t pretty (4 appearances, 4.24 GAA, 83.5 SV%), but there’s a possibility that he finally turned the corner and is ready to establish himself as a starter. Frankly, there couldn’t be a more timely development for Colorado. Even if he does hold up his end of the bargain, it might not be enough. Calgary is a deep and dangerous squad looking to make noise in the postseason. With that said, it does have another weakness beyond goaltending: the power play. While the Flames were laying waste to teams left and right late in the year, they struggled mightily on the man advantage (8.6%). Only the New York Islanders fared worse in that situation. Should Grubauer prove stingy at 5-on-5, Calgary’s impotent power play could create a sense of frustration for a team that hasn’t dealt with much adversity this season. And what if Smith and Rittich falter as well? No one ever feels comfortable playing in front of a shaky netminder. MacKinnon, Rantanen and Landeskog don’t require many chances to find the back of the net and Tyson Barrie (59 points in 78 games) finished seventh in scoring among defensemen. Up front and on the back end, the Flames hold a significant advantage. They should win this series. However, the goaltending is such a total unknown at this point that it may plant a seed of doubt and level the playing field in a hurry. The last line of defense has the power to turn title contenders into paper tigers and underdogs into overachievers.